Don’t fall back into old eating habits and sabotage your nutrition and fitness goals this Autumn! What is it about October 1st that already makes your pants feel tight?! The abundancy of pumpkin spice everything and the promise of upcoming Halloween treats makes my heart and stomach flutter! If we aren’t careful, October 1st can very quickly be a freefall into three months of over indulgence between fall splurges, Halloween, Thanksgiving and the winter Holidays. To compound the issue, each holiday is filled with its own traditions and activities that usually all revolve around food! Instead of simply commiserating and salivating over favorite fall foods, let’s really examine why the fall is such a threat to our waist lines and how to combat weight gain. Gaining weight over the Holidays does not have to be inevitable! Autumn is often accompanied by specific flavors, recipes and traditions that are very seasonal-specific. You would probably not think of going to a pumpkin patch or apple picking other times of year! But all of these great activities and traditions are usually accompanied by foods we can’t get other times of year. Homemade donuts at the farm where you pick apples, fresh pumpkin bread sold at the pumpkin patch or made by your mother-in-law, hot cider sold in both places or home-made! These fall treats become very tempting because of their scarcity and their tradition. One major component of weight gain, loss and maintenance is our mentality. Most of us know that donuts are not nutritionally sound or healthy. And if we are focusing on our health, most of us would agree that we should eat donuts in moderation or try to forgo them all together. While this sounds super easy, many of us really struggle saying no to donuts. So that is where our mentality comes in! Improving our mentality helps us learn to think differently about foods like donuts. If we are passing a chain donut shop, we can use different techniques to avoid stopping or, if we decide a donut is truly what we want we can use different techniques to enjoy a donut in moderation. In other words, we start to really think about and analyze our eating habits which helps us make more informed choices toward our nutrition. If we go back to the idea of a food item being scarce for a moment, this tends to change our mentality toward the item. The grocery-store donuts are available all day every day which can often make it easier to not buy them every trip. But the special, freshly made donuts that are ONLY available during the fall that are so hot and fluffy… these are much harder to refuse! They are much more coveted and special. It makes saying “no” to them much harder. These types of seasonal treats are often part of our traditions. We have always had freshly made donuts and apple cider while pumpkin picking with our family! It’s a tradition! Just like we always have turkey, stuffing, mashed potatoes and gravy and multiple pies at Thanksgiving. It’s tradition! Aside from reminiscing about traditions, we could spend hours talking about the influence of our families on our eating habits but that is a great topic for another blog. I will say that our families influenced our eating habits from the moment we were born but this does not mean we have no control over our eating habits. Limited availability and/or our family traditions often over-ride the desire or intention to make healthy nutrition decisions. But we can change this! 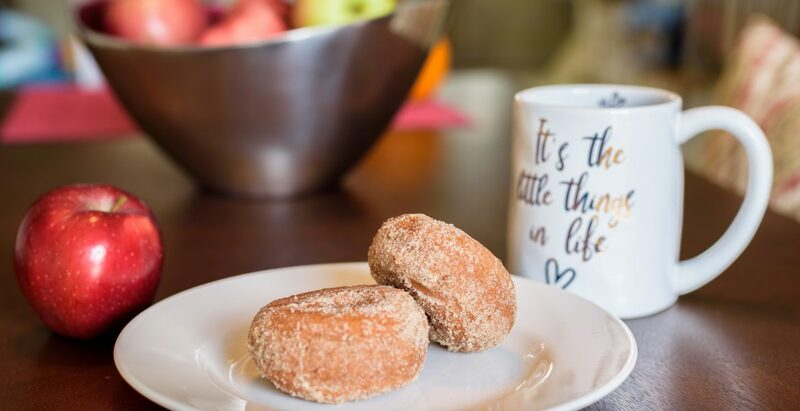 Now, if we were only talking about one trip to the pumpkin patch and one sleeve of freshly made donuts with a cup of fresh apple cider, even the most health-conscious people would probably acquiesce. But how often do you only splurge once? I don’t! I eat the donuts and fresh cider at the local pumpkin patch but we usually visit more than one pumpkin patch every October! I also then have my favorite Halloween candy the night (okay week) of Halloween. And that mindset continues way into November and December. Especially December! Now some of us will decide that we will spend an extra hour on the treadmill or an extra hour on the bike to make-up for our indulgences. While unfortunately this doesn’t work and honestly rarely actually happens, the bigger issue again becomes the frequency of over indulging. If you are trying to reach or maintain a healthy weight, allowing too many fall indulgences is a slippery slope. Similarly, if you are stringent about your nutrition because of the link between certain foods and pain, many of the foods we would want to indulge in are also the foods that trigger more pain within the body. So again, too many indulgences set you up for continued indulgences and more pain. You are probably shaking your head by now, either out of total agreement because you too have been there before or out of annoyance! “Amanda” you are yelling, “you make it sound like we can’t eat anything but air and ice chips!” That is hardly the case my dramatic friend! I am merely suggesting we follow many of the same techniques my clients learn in the mentality section of Optimally Balanced. Prioritize what is most important to you both in the immediate and the long term. In the long term, I want to maintain a healthy weight and increase my fitness ability. I also want a healthy relationship with food. That to me is so important that I want to eat in ways that don’t leave me with guilt or self-hate. In the short term, I do want to be able to not feel deprived and still eat foods that are important to me. So I need to really be conscious in my eating and food selection. If I really want the donuts at the pumpkin patch, maybe I eat one or a half of one and I truly enjoy it. But then I skip the cake and desserts for a few days. I eat meaningfully and ensuring that eating one unhealthy food doesn’t turn in to a free-for-all. Sometimes I am craving something really sweet after dinner like ice-cream or just something chocolate. To stay on track, I can either make or buy many healthy or at least minimally unhealthy ice-creams and chocolate options. Many people love sugary coffee drinks. There are numerous recipes to make these types of drinks at home with substantially less sugar and fat than you can buy them at major coffee chains. For a fall-themed treat, I might bake an apple with Splenda-brown sugar and cinnamon instead of apple pie and feel just as satisfied. Smart eating does not equal deprivation! Really paying attention to what you are eating; and eating it by enjoying and tasting every bite will often lead to greater meal satisfaction and a reduction in eating. I have found that when I slowly and purposefully eat my meal (ie not with the tv on, not on the couch or in the car) I enjoy it more and naturally eat less. While we usually can’t exercise extra just to burn off what we ate, exercise is super important! One reason is that the more we engage in healthy habits like cardio, yoga, weight lifting, and outside activities like bike riding, walks, etc the healthier we feel overall. Often when we are active, we are less tempted by unhealthy choices. An increase in activity can also lead to a healthier self-image. If we consider ourselves or label ourselves as healthy people, it is easier to also make smart decisions related to food. Let’s think about that one for a minute, if you view yourself as a fit person, you are more likely to make healthy choices such in all areas of your life. How you think about yourself impacts your behavior. Sounds like our mentality plays a big role! This tip is so novel yet so simple! Just because a family tradition exists, it does not mean you have to follow it with 100% compliance! You are not a better grandchild because you cleaned your plate at Thanksgiving or ate seconds or thirds of grandma’s pie. Consider revising traditions and building new ones such as adding activity into your family holiday get togethers. Consider making healthy choices part of future traditions. So while the beginning of autumn with its delicious aromas and time-honored traditions can easily tempt even the best-intentioned person’s diet and exercise routine, there are many tricks and techniques that can help! Let me know how the above work for you and consider more formal coaching with www.optinallybalanced.com. Let’s work together so your pants don’t get tighter this Holiday season!